Here are answers to some of the most Frequently Asked Questions (FAQs) from our guests. If you have other questions or have a concern about something you experienced at one of our restaurants, please don’t hesitate to Contact Us. Sunset Grill is open every day of the year except for December 25th, Christmas Day. At Sunset Grill, most of our restaurants are steady throughout the day on weekdays. Weekends can be busy with line ups all day. No matter what time or day of the week you arrive, we work through the lines quickly as our friendly staff are committed to serving a delicious and freshly prepared meal quickly. Can I make a reservation? Can you accommodate a large group? All of our restaurants operate on a first come, first served basis so we do not take reservations or group bookings. Our customers typically arrive hungry and in a hurry and this allows us to seat guests as they arrive at any time of day. Do you offer takeout? Delivery? Our entire menu is available for takeout. You may place your order in advance by calling the restaurant directly or by ordering at the front counter when you arrive. Sorry, we do not offer delivery at this time. 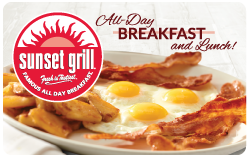 Find your closest Sunset Grill on our Current Locations Page. We can provide platters of select menu items for your occasion. This service is for pick up only. Please contact your local Sunset Grill directly to discuss options that would best suit your needs. Do you do anything special for guests celebrating a birthday or other special occasions? Sunset Grill is the perfect place to celebrate! If someone in your party is celebrating a birthday, anniversary or special occasion, let your server know and the special guest will be presented with a complimentary Dessert Pancake. Why are you called Sunset Grill if you are not open in the evenings? Our California style concept was inspired by the lyrics from the Don Henley hit song “Sunset Grill,” which reached top 10 of the Billboard Charts in 1985, the year Sunset Grill opened its doors. We are a niche restaurant that specializes in breakfast and brunch offerings; and our shorter hours mean that we are committed to serving our guests the best fresh-made breakfast in town. Why do you use electronic devices (i.e. iPads, iPods) to take orders? Our servers use iPads and/or iPods to input orders into our system, which makes the process more efficient and speeds up service. Do you offer group discounts or specials for seniors? 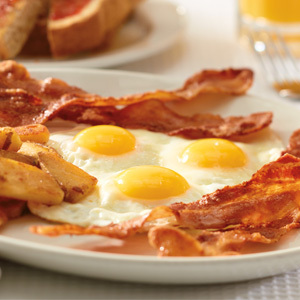 We offer a Breakfast Special Monday to Friday before 11am which includes 3 eggs, home fries and toast for $4.99*. Why does your menu state that you do not allow substitutions? Most of our menu items are only served one way. Our “No Substitutions” policy allows us to focus on serving guests the freshest food in the fastest way possible. Our formula for success has helped our kitchens run efficiently since 1985. If you would like to order something different to what is listed on our menu, your server can help build your order using our Side Order menu. I love Sunset Grill coffee. Where can I purchase it? At Sunset Grill, guests enjoy free refills of our Signature Blend coffee. Our freshly ground premium coffee is a medium roast private blend of the finest South American, Central American and Kenyan Arabica beans grown at high altitudes. It has a clean taste and is of superb quality. Our Signature Blend 1kg bags of whole coffee beans can be purchased in our restaurants for $19.99. How do you cook your home fries? The home fries at Sunset Grill are prepared fresh every day. We start with whole potatoes that are cut in store; steamed or boiled and finished on the flat top grill. The potatoes are cooked in Vegetable (Soybean) Oil and gently seasoned with seasoning salt. I have a nut allergy; can I eat at Sunset Grill? If you have a food allergy, please inform your server and we will do our best to direct you to a safe menu choice. You should be aware that we do have portion packages of peanut butter, granola containing nuts, and bagels with sesame seeds in our restaurants. We cannot guarantee that other foods have not come into contact with nuts. For other allergy concerns, please contact us or visit one of our restaurants so we can discuss your options. Sunset Grill is not a gluten-free restaurant; however, we do offer our guests the option to substitute regular toast for gluten-free bread upon request for a charge of $1.00. We cannot ensure that cross-contamination with other products will never occur, as we use the same equipment and surfaces. In addition to bread, hamburger buns, bagels, and English muffins, items on our menu that contain gluten include: pancakes, waffles, French toast, sausages, Hollandaise sauce and Caesar salad dressing. Please inform your server of your dietary restrictions and we will do our best to direct you to a safe menu choice. How does Sunset Grill support “local”? Did you know that almost a quarter of our total food spend supports Local-Ontario producers (i.e. dairy, proteins, and vegetables)? Our Grade A small eggs are from local Ontario farms. In addition to this, our turkey bacon comes from Ontario’s Hayter’s Farms: free roam and farmed responsibly. Our sausages are 100% Canadian pork and manufactured in Canada. Our ground beef and chicken are also from Canadian farms, supporting our local economy and farmers. Our granola is organic, whole-grain, and made in Quebec. It contains a high source of fiber and iron, 0 trans-fat, sodium or cholesterol. Sunset Grill low-sugar content potatoes are from the Russet Burbank premium crop, grown sustainably on Hillspring Farms in Bath, New Brunswick. Calorie counts are listed on our menu as mandated in the Ontario Healthy Menu Choices Act, 2015. How can I supply my product or service to one of your locations? If you have a product or service that you think would be great in one of our locations, please contact our Head Office by submitting a General Inquiry through our Contact Us form. Someone from our Operations Department will contact you if we would like more information. Yes! You can purchase a gift card in-store at any of our restaurants. These gift cards can be used at any of our Franchised Locations. Can I purchase Sunset Grill gift cards in bulk? Yes! Sunset Grill gift cards make excellent presents and we are happy to fulfil bulk orders. Please contact our Head Office directly at [email protected] or call (905) 286-5833 for assistance with bulk purchasing and activation of gift cards. Visit the Cardholder Web Portal, available 24 hours a day, 7 days a week or visit any Sunset Grill restaurant and ask your server to check the balance. Please note that the 1-800 phone number on our older style cards is no longer in service. In addition to this, the older style cards can no longer be reloaded, whereas the newer style (white background) gift cards can be. To check your balance using the Cardholder Web Portal, use your 19-digit gift card number (no spaces) as the Login ID. This number can be found on the back of your card. For our older style cards, the default password is: 123 and for our newer style (white background) gift cards, the password will be the three-digit CVC code found on the back of your card. Click on “My Card” to display your card status, balance, and transaction history. How can I find out the latest about Sunset Grill? Find out all our latest information by following us on Facebook, Instagram, and Twitter, or subscribe to our e-newsletter for updates such as new store openings, limited time menu offerings, Sunset Grill in the community, and more. When is Sunset Grill opening in my area? Visit our Coming Soon Locations page for a list of Sunset Grill restaurants that are coming to your neighbourhood. We give back to our communities all year long by donating gift cards to various charitable groups and events. Please contact the Franchise Owner at your local restaurant for information. Please note that none of our restaurants make cash donations. Sunset Grill also supports select national charitable causes; most notably the Canadian Cancer Society through our Annual Pancake Tuesday Fundraiser event. Sunset Grill holds an annual fundraising event on Shrove Tuesday, serving pancakes for $1 each all day long. All funds raised are donated to the Canadian Cancer Society. 2018 marked the 10-year anniversary of our fundraiser. With your help we’ve been able to raise more than $142,000 to help fuel the fight against cancer. Our next Annual Pancake Tuesday Fundraiser event happens on February 25, 2020. Do you have restaurants outside of Canada? Currently we have restaurants in Canada (Ontario, Alberta) but have long-term plans to expand to select markets in the United States. How can I find out about owning my own Sunset Grill restaurant? All Sunset Grill restaurants are franchised and owner-operated. To find out more about owning your own Sunset Grill, visit our Franchise page. I want to work at Sunset Grill; how can I apply? All of our restaurants are owner-operated and we encourage applicants to apply in person at the location you are interested in working at. Visit our Careers page to view job descriptions and find Current Opportunities. If the restaurant you want to work at is currently under construction, please apply in person once a “Now Hiring” sign has been posted. Will Sunset Grill consider my real estate opportunity for a future Sunset Grill restaurant? Please submit your information to our Head Office by submitting a Real Estate inquiry through our Contact Us form. All submissions are reviewed by our Real Estate Department who will contact you if we would like more information. Are Sunset Grill locations accessible? With the exception of some of our older locations, our restaurants are accessible and/or provide an alternative entrance to accommodate those with mobility issues. If you have concerns regarding accessibility at one of our locations, please contact the store before your visit and we will do our best to accommodate your needs. You can find a list of our locations with contact information here. We welcome service animals in all of our restaurants. Sorry, no pets allowed. Yes, we are happy to accommodate. I have a question about accessibility at Sunset Grill. Who do I contact?